Amazon drops plan to build a new headquarters in New York City. On Feb. 14, Amazon canceled plans to build a new headquarters in New York City. In September 2018, Amazon became one of the first publicly traded companies to reach a market cap of $1 trillion. The company started as an online bookseller but now boasts a range of products, services and deals. Amazon announced that it will cancel plans to build a new headquarters in New York City in a Feb. 14 blog post. “After much thought and deliberation, we’ve decided not to move forward with our plans to build a headquarters for Amazon in Long Island City, Queens,” the post stated. Amazon faced opposition from local leaders who criticized the company for receiving $3 billion in government incentives for the deal. In September 2018, Amazon became the second publicly traded company to reach a market cap of $1 trillion, just behind Apple. In July 2018, Amazon released its second-quarter earnings report including $52.9 billion in sales, up 39 percent from one year prior, but below market expectations, according to Reuters. E-commerce giant Amazon has come a long way, growing from an online bookseller in the early days of the internet to a retail giant that is disrupting everything from the assumed supremacy of big-box stores like Walmart to grocery store and delivery service models. The company boasts a large range of services and deals, the largest of which is the members-only Prime Day event. Bloomberg reported that, according to a Wedbush Securities Inc. analyst, Amazon shoppers spent approximately $4.2 billion during the 36 hours of Prime Day discounts and sales in July 2018. Prior to Prime Day 2018, a series of strikes by European Amazon workers and an international boycott of the event were expected to potentially affect the overall earnings. All information on 52-week range is accurate as of Feb. 14, 2019. One of the most reliable gauges for what a company is really worth is market capitalization, or market cap for short. The market cap is the value of all of the company’s stock combined, giving you a sense of what value investors are placing on the company based on the price it is trading at. Amazon’s market cap has ranged between $639.1 billion and $1 trillion over a 52-week period. Based solely on Amazon’s revenue and profits from the last three years, Amazon is worth just $160.5 billion. The fact that this number is so much lower than Amazon’s market cap reflects the decision that any investor has to make about a company like Amazon before deciding to purchase stock. Amazon is a fast-growing company, and the large market cap indicates that investors are willing to pay more based on its potential for future earnings even if its current revenue and profits don’t quite warrant the price. So, if you’re a more conservative investor, Amazon’s current price is likely going to seem outrageous to you. If you’re more forward-looking and ready to take a chance on Amazon continuing to grow, however, you might be willing to pay a premium. Only time will tell who’s right, but the stock made a more than 500 percent gain from $253.90 a share to $1,582.26 from May 2013 to May 2018, meaning the less conservative approach would have meant huge returns for that period. Amazon’s CEO, Jeff Bezos, is also its founder and chairman. His nearly 80 million shares constitute 10 percent ownership of the company as a whole and represent over $128 billion of his total net worth, which Forbes reports at $134.8 billion as of Feb. 14. The rest of the five largest shareholders are the Vanguard Group Inc. and Blackrock Inc. — with each owning more than 25 million shares — and FMR, LLC and State Street Corp. — with each owning over 15 million shares. 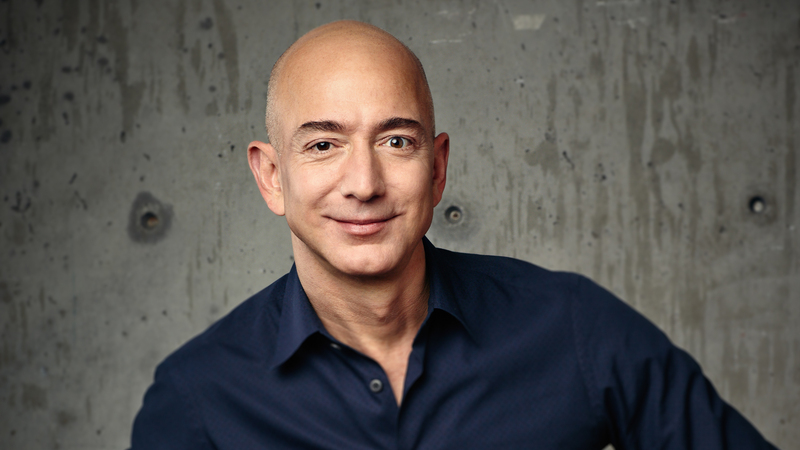 Bezos worked at a hedge fund before he left the business to found Amazon in 1994. He used books as a starting point before he expanded Amazon into an online retailer for almost any product. In 2018, he was ranked by Forbes as the wealthiest man in the world. Learn more about 10 stocks like Amazon that are gifts that keep on giving. The retail giant's withdrawal negates potential revenue for NYC. GOBankingRates > Making Money > Business > How Much Is Amazon Worth?